Yup, being in your bathroom is like taking a time machine to 1982. The hardware is at least that old. The hard-to-reach places are getting moldy. You’ve already replaced the shower head, but the rest of it is a bit rusty. The tub has a permanent gray ring caused by a chiliad of baths that has slowly defied scrubbing. It’s time for a change. But where do you start? Obviously, your budget needs to be considered. Materials vary greatly in quality, from basic to very high-end. Luckily, much of the labor is easily incurred by the consumer. Stylistically, there is a particular rule that has become a standard: conceal the toilet from immediate view. Arrange it so it is not the first thing someone sees. For instance, if the bathroom door is open, it is aesthetically ideal for the toilet not to be visible. It’s something you may never have given a second thought to, but now that you’re aware, it likely makes sense. And there are many options for accomplishing this. For instance, it could be perched between the tub and the vanity. If you’re on an extreme budget, you might contemplate finding a fanciful matching hamper that perfectly obscures the commode from sight. You also must consider the transition into the adjoining room. A bathroom is typically tiled. The rest of a house’s floor is either hardwood or carpeted. Sometimes the two surfaces won’t be perfectly aligned and a custom edge-reducer will be necessary. Cost efficiency may be increased by leaving some of the original elements intact. Tearing out the wall and floor tiles can be expensive and labor-intensive. Keeping them, however, will not only make the task easier, but may be perceived as “cool vintage”. You may also consider changing how the illumination affects the room. You may want to add additional lights to compliment the primary source. In doing so you are able to create a decorative and atmospheric environment. For more ambitious effect, you may choose to have varying degrees of light emanating from above, below and both sides of the primary mirror. You can choose ambient lighting, achieved by bouncing light off the ceiling, to soften shadows. Accent lighting is used to add depth and accentuate design features, and decorative lighting is sourced from ceiling fixtures. Naturally, you’ll have to get measurements for everything. 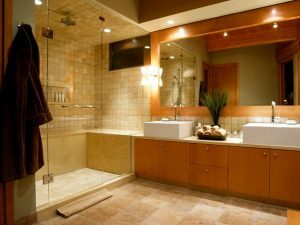 You may want that King Size tub, but the average space allotted won’t allow it. Familiarize yourself with the dimensions for the room and its hardware. You may even decide to customize the height of your sink. Typically they are 34 inches from the floor. But if you’re particularly tall, you may want to increase the length. After all, you don’t want to have stoop uncomfortably low while washing your face. All options are easily accommodated. If you don’t have much room to work with, there are measures you may take to maximize space. Moving the sink to the corner is an example. There are diagonal-cut sink vanities that are extremely space-efficient. You may even consider a smaller tub. If you’re one who prefers a shower, this is of minor hindrance. Heck, if you NEVER take baths, just convert the tub into a shower. Presto – you have more space to work with. Plus, it may appear elegant and reflect positively on your design choice. Speaking of vanity, what will you be looking for when choosing one? This may be the most important decision you’ll make. 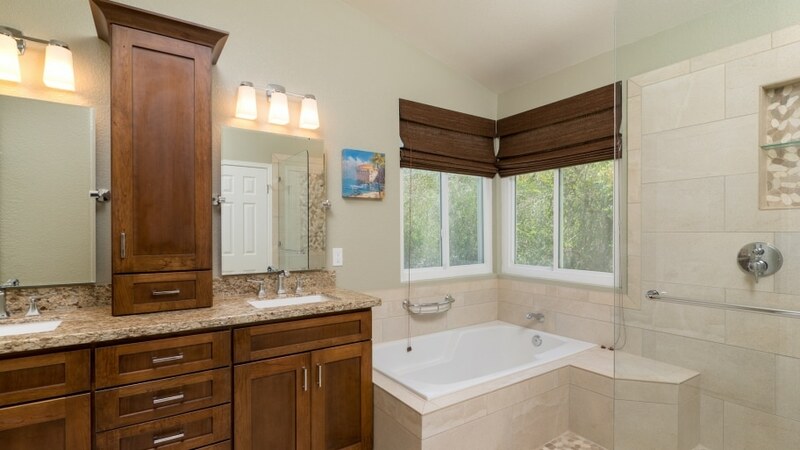 For the average bathroom, a large vanity is too cumbersome. You don’t want to prevent easy mobility, but you want to comfortably accommodate your needs and have enough storage space for various toiletries. 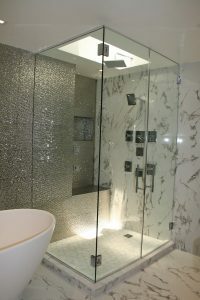 Here’s a little trick that will help you perpetuate the image of luxury: buy high-end fixtures. They’re small enough that even that best ones won’t break your budget, but they may be unique enough to become the eye-catching points of interest. This idea is best when wanting to portray the sense of a preferred style. For obvious reasons all bathrooms should have a window. But what you may not consider is the importance of removing moisture, which is the root cause of mold and mildew. Having a dry restroom is important, and keeping it as such may further be facilitated by the addition of a fan that vents to the outside. So how about it? Are you ready to take your bathroom into the modern age? Of course it doesn’t have to look modern, and that’s part of the fun. It can reflect you and your personality. 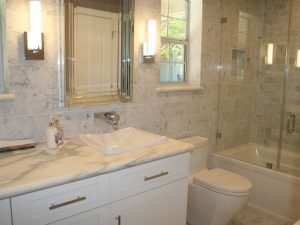 From Victorian to Colonial, vintage to contemporary, the style of the lavatory is just as important as any other room.